I just got finished baking a pineapple upside-down cake and man that cake looks sooo good! It is for a customer's husband birthday tomorrow. He is from New Jersey :) and he misses the bakeries there so she contacted me! I felt so proud. Here is a picture. Now don't that look delicious! Going backwards.. this past Sunday I participated in a local bridal show in York. It took me three days to get ready for this show and even then I still felt like I needed more time because I didn't do everything I wanted to do. I did take pictures of what I did do and I am very proud of myself. I think my tables looked nice. I got lots of comments about my mini candy buffet and on my mini cupcakes I made as samples. I made strawberry with lemon bettercreme, pound cake with chocolate truffle and chocolate pound cake with white chocolate truffle. I also did two table raffles (for 6 cupcakes and 16 cake balls) and entered a 3 tiered cake into the show's raffle. The cake with chocolate cake with chocolate truffle filling and vanilla bean with white chocolate truffle filling. It was very pretty. My hubby came along to help me and we even brought Jayden. He behaved himself for the most part, mainly I think because it was so much stuff to look at. I bought us t-shirts with my business name on them to wear and I also made my own table decorations and dummy cake to show off my cake skills. I got a chance to network with other local businesses and even got some interested brides as well :) It was alot of work to get ready for but I will definitely do it again. Going backwards once again... I had two deliveries to do last Saturday. One was for a 30th birthday and the other was for a bridal shower. The 30th birthday cake was chocolate cake with peanut butter buttercream. My client ordered the cake for her boyfriend and she wanted skulls and stars on the cake ( I just do what the ask) and she also wanted the cake to be covered in black fondant. At first I thought the combination of things on the cake would look crazy, but once I was done it didn't look to bad. The other cake was for my client's aunt was getting married and she wanted a simple yet blingy cake. So I suggested rhinestone banding around the tiers which the client absolutely loved! The cake was chocolate with mocha buttercream and pound cake with honey-cinnamon buttercream. When I dropped the cake off she was very happy. I feel so proud when my clients are happy with the cakes that I make for them. Once again I have fallen behind on my blogging :( It seems when I start to get into the groove I get busy and then I forget to blog. The main reason for my lag in blogging a little guy name Jayden. He has finally learned how to roll over so now I have to watch him whenever I place him down because he will just roll. I used to be able to place him on the couch do a couple of things while checking on him, now I can't do that anymore or the little man will end up on the floor. Bad for mommy and baby. He is also trying to slide around but mostly in a circle. He went from being non-mobile to the beginning stages of crawling like over night! He is also more vocal now, especially in his dislikes (i.e. when Mommy leaves the room)so I have been trying to find ways to keep him entertained while trying to clean the house, conducting business and baking cakes. But the big news is that he is finally sleeping on his own! Yah! Yah! And he is sleeping mostly through the night too! So it won't be long before he is sleeping all the way through the night. On to the cakes:) So I have lots of pictures today since I haven't been blogging. I will post them below. 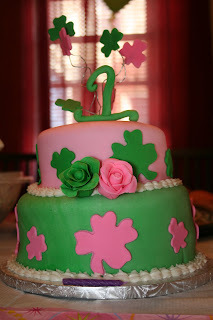 So I finally have the picture of the shamrock 1st birthday cake. And I have a picture of the cute little munchkin it was for. 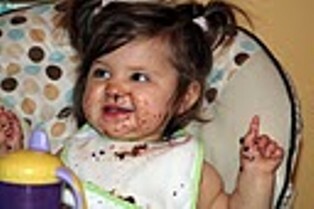 She really loved her cake. I also have the picture of the little cake I did for my hubby's friend. Also in March I have pictures of the dessert buffet I did for my friend's bridal shower. Other pictures include cupcakes for my site. I am constantly making updates and revisions to my website as my business changes and I come up with better ideas to promote my business and to bring in more clients. So I have decided to start a new gourmet cake line for the more adventurous customer who likes exciting flavors combinations. In conjunction with the new line I am also running a cake giveaway for a 6" cake for the person who comes up with the most unique cake flavor combination. The giveaway ends on the 24th and the winner will be announced on the 25th. I am getting more and more local calls which is great and I think the bridal show that I am participating in this Sunday will bring in more customers. I have so much in my head that I will be blogging over the next couple of days to get it all out. So tomorrow I will be discussing my participating in the bridal show and what I plan on doing since this will be my first one. Today is all about my past cakes and cupcakes orders. I recently did a cupcake tree for a 7 year old birthday. The theme was hearts with lots of bright colors. So I made the cupcake tower, cupcakes and cupcake topper in the theme the client requested. The other big cake I got to do was for my sister in law. She turned 16 and we (hubby and I ) decided to surprise her with a big cake. I liked doing this because I had free range to do what I wanted to do so I made it square and round with zebra print and circles on it. She absolutely loved it and was soo surprised! I also made Oreo Truffles for one of my hubby's co-workers. Below are the pictures of the cakes/cupcakes. Enjoy! Little Jayda enjoying her birthday cake.